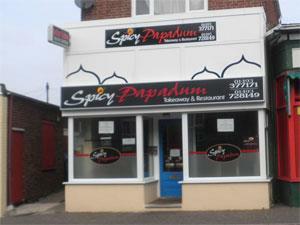 Spicy Papadum in Caister-on-Sea near Great Yarmouth is a restaurant and takeaway in the centre of the village serving Indian cuisine. Popular with locals and holidaymakers alike. From Great Yarmouth follow signs for the A149 Caister-on-Sea, proceeding straight ahead at the mini-roundabout by Yarmouth Stadium towards the village. At the next mini-roundabout turn right onto Tan Lane and Spicy Papadum is located immediately on the left. Parking bays outside.